invite you to share in our joyful worship each Sunday morning and in special events throughout the year. Though a small congregation in numbers, we are big in the peace and joy of God (shalom). This is a place you can easily find rest from a hectic and fractured world. 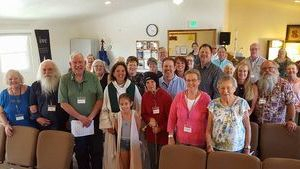 PIC is a combined Episcopal (Episcopal Diocese of Colorado, ECUSA), and Lutheran (ELCA) congregation. While there are some differences between our denominations, we celebrate that our unity is in Christ. We are all a people living in and celebrating the grace of God for all people through Jesus Christ. 2018 Annual Report - Click to Download!